Nikolas Cruz, the 19-year-old accused of killing 17 students and teachers at a Florida high school, said he felt "worthless" and repeatedly indicated that he wanted to die, according to a newly-released transcript of what Cruz told police following the Feb. 14 shooting. Cruz allegedly admitted to carrying out the shooting at Marjory Stoneman Douglas High School in Parkland, Florida, and questioned why detectives didn't kill him, according to court documents obtained by ABC News on Monday. "Kill me," the teen muttered to himself at one point, followed by a stream of expletives, according the 217-page partial transcript. Cruz was alone in the room at the time but the recorder was still going. John Curcio, a Broward Sheriff's Office detective, had stepped out grab some cold water for Cruz. There were also instances where Cruz would talk to himself and ask aloud why he wasn't dead. "I want to die. At the end you are nothing but worthless, dude," he mumbled to himself. "You deserve to die." Cruz also described a so-called demon in his head that urges him to "Burn. Kill. Destroy." "I hear demons ... a voice, demon voice," he said, adding that the voice had told to hurt people on the night before the shooting. "The voice is, is in me ... To me, it's me and then my bad side ... It's a voice. The voice is in here and then it's me, it's just regular me, just trying to be a good person." Curcio probed Cruz about why he didn't seek help. "You could have stopped the demon by getting a prescription for marijuana. You could have stopped the demon by getting a prescription for Xanax. You could have stopped the demon any time you want. You didn't want to stop the demon," Curcio said. "I don't like the demon," Cruz replied, before ending the interrogation and requesting an attorney. Video of the confession will be released Tuesday. The transcript also described a meeting Cruz had with his younger brother, Zachary Cruz, although parts of the conversation were redacted. "People think you're a monster now," Zack Cruz said. "I know you probably felt like you had nobody but I care about you." He added, "I know I make it seem like I didn't care about you at all. I know I made it seem like when we were growing up that I hated you ... but truth is ... I love you with all my heart." 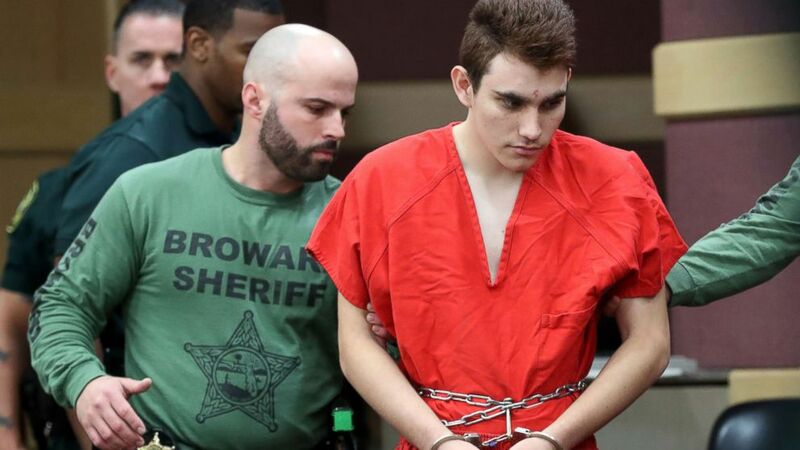 "I'm sorry, dude," Nikolas Cruz responded. Nikolas Cruz -- who took an Uber to the school on Valentine's Day, according to Broward County officials -- slipped away from the campus by blending in with other students who were trying to escape, police said. He was later apprehended. Cruz is charged with 17 counts of murder. Authorities have yet to release details on why the former Marjory Stoneman student allegedly stormed into the school with an AR-15 and opened fire. A judge entered a not-guilty plea on his behalf during his arraignment in March.